More than 60 brethren assembled at Cleveleys Masonic Hall to witness Gordon Hinchliffe being installed into the chair of Royal Oak Lodge No 5919. Giles Berkley (left) congratulates new master Gordon Hinchliffe. The principal guest was Giles Berkley, accompanied by fellow grand officers Past Assistant Provincial Grand Master Harry Cox, Tony Hough, Keith Jackson, Geoffrey Pritchard, Duncan Smith and Chairman of North Fylde Group Peter Greathead, supported by acting Provincial grand officers Jason Dell, John Pitches and Bill Sergeant. 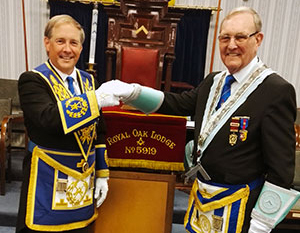 The regular lodge business was swiftly dispatched by the master Russell Forsyth who proceeded to invite Ronnie Coles to act as installing senior warden, Frank Kenyon to act as installing junior warden and Chris Molyneaux to act as installing inner guard. Gordon was then presented by the evergreen Arthur Cartain. The master elect was installed in a heartfelt manner by Russell Forsyth with assistance from the excellent director of ceremonies Alex Tomlinson who delivered the rarely heard working tools of an installed master. The working tools in the three degrees were particularly well presented by Arnold Flint, Martin Poole and Stuart Brown. The officers of the lodge were then invested. 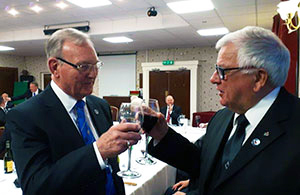 The newly-installed master Gordon Hinchliffe (left) is toasted by Tom Pearson during the singing of the master’s song. Arthur Cartain delivered an excellent address to Gordon, followed by the address to the wardens by Duncan Smith and to the brethren of the lodge by Giles Berkley. At the conclusion of the installation, Giles congratulated Russell on the manner in which he had installed Gordon. On behalf of the lodge, Gordon presented Giles with cheques for charities of £1,000 to the Masonic Charitable Foundation 2021 Festival and £500 to the Cleveleys Masonic Hall Building Fund. The lodge had previously donated £600 to Georgia’s fund and £500 to the Brain Tumour charity. Giles thanked the lodge on behalf of the many recipients. The brethren were treated to a wonderful festive board at which a raffle took place which raised £371 for charities. The toast to the newly made master was given by Russell Forsyth and the master’s song was rendered by Tom Pearson. At the conclusion of a marvellous evening the tyler’s toast was presented by Bob Major. Pictured from left to right, are: John Cross, Duncan Smith, Geoffrey Pritchard, Keith Jackson, Tony Hough, Peter Greathead, Giles Berkley, Gordon Hinchliffe, Russell Forsyth, Bill Sergeant and John Pitches.